Immediate first thoughts: (1) No uber, but the country is relatively small. So to walk about 4.6 miles took just about 2 hours, which meant… good start to the morning. (2) Food is hella expensive. On average, meals run $30 USD and that’s just for a burger and fries. (3) population of Iceland totals 323,002, so the streets of Reykjavik are relatively slow. (4) The highest building was no more than 18 floors, at least from what I saw. (5) US phone carriers have affordable phone plans to allow use of satellite, so for the first time in many international trips, I wasn’t looking for a sit down lunch that had Wifi access. Funny story to start… Matt and I booked an Air B&B, in my opinion it allows me to meet people in the places I stay, have an idea for how the homes are around the world and is generally really affordable. 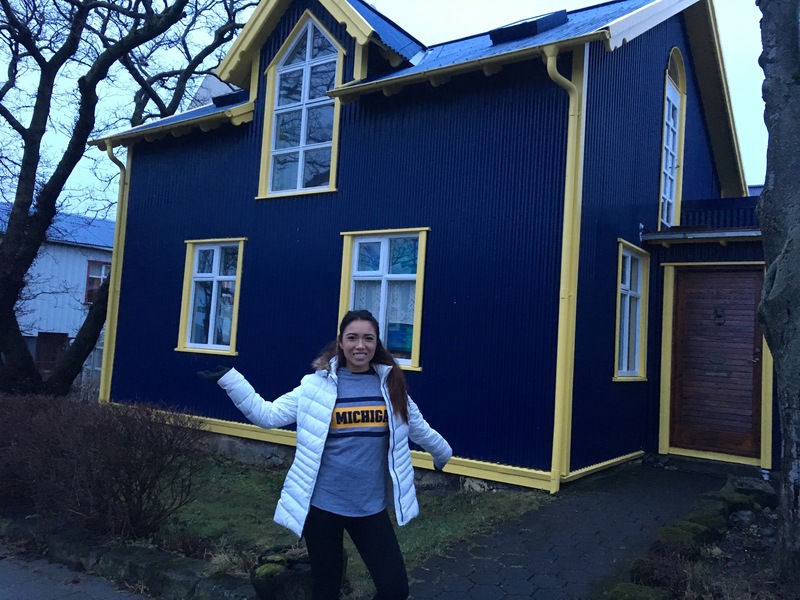 Additionally, we knew would be arrive in Iceland to their local time of 4:35am, and our host, Karl, had noted in his bio he allowed early arrivals. We notified him our of early arrival. Well, we get dropped off from our airport transfer (in the rain) and no answer to the door. Literally thought we were going to have to sleep in the rain, given that the residential area is set up about 15 minutes (car ride) from the main city. Rang the door bell, and the first time (has to be a first for everything) welcomed by a non-English speaking mom, who we later found out to be Karl’s wife’s mom. Needless to say, Karl (who we also later found out is in Denmark) forgot to mention we were coming early. But in good news, we were let in. What a good way to start Sunday (2/19), Women’s Day in Reykjavik. Valentine’s Day x2 in one year, boom! If you plan on using Air B&B… the main city set up separate from the residential area. Excursions that are booked do not pick/up drop off from Air B&B houses. You have to be booked through a hotel. This is why after the first two nights, Matt and I will be relocating. Iceland is made for tourism. Unfortunately for Matt and I, the morning started with an e-mail that our Northern Light Bus tour was cancelled due to weather not permitting visibility. Truth is, in case that was to happen we purposely put that first on the itinerary for this trip. Now, we are scheduled for tomorrow. Things coming this week: snowmobiling, hop on/off bus, Golden Circle Tour and the Blue Lagoon. The highlight today (2/19) was seeing the Hallgrimskirkja, the tallest church in the city and can be seen from almost anywhere. This was our compass. We also took the elevator to the top floor, which allows you to see the city from a new vantage point and quite honestly where you see all the colors the city has to offer. Most of the buildings are made of concrete so very meek and basic, but their ROOFS remind me of Spain and Portugal. The best road, is the one less traveled… it builds character. Thankfully, I have a traveling partner who doesn’t mind my ambitious and thrifty way of traveling… by foot! This was anticipated given we decided to save $350 on a rental car– ridiculous! The road less traveled is good, but time is also money. So to counter balance the 2 hour walk to the city, we met a war refugee who has now lived in Iceland for 18 years, who taught us that riding the bus back to the residential area was for the whopping sum of $1. Now that, was desert. 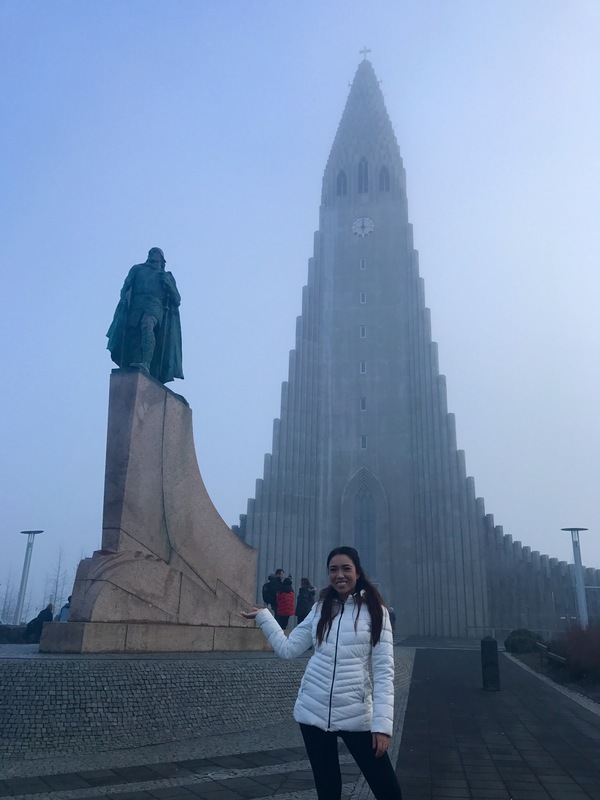 Itinerary: Walked from Region 110 to Hallgrimskirkja, walked to the top of Hallgrimskirkja, toured downtown/shopping district, ate Japanese noodles/subs, Jorgensen Resturant for drinks and fantasy eats, bus ride back to Region 110 (total cost $1, talk about economical! ).